In this post, Professor Paul McKeigue analyses the recent report of the UN-OPCW Joint Investigative Mechanism into the chemical incident in Khan Sheikhoun, Syria, in April 2017. In the light of its findings, he compares the likelihood of two scenarios: (1) the official US-UK hypothesis of a chemical attack by the Syrian air force using sarin; (2) the ‘false flag’ hypothesis that small quantities of sarin were used to generate a forensic trail to disguise a managed massacre of the victims. Clearly, this raises very serious questions indeed. Meanwhile, a basic question for the reporting panel itself is how it came to express ‘confidence’ in a hypothesis that appears to have zero likelihood. ‘Confidence’, I suppose one might reflect, is a subjective state of mind, and it may be natural for people to feel more confident saying something they know their most important audience wants to hear than saying something more challenging. Feeling confident about something, however, should not be confused with being right. As ever, though, I leave readers to see what they think of Paul’s analysis. The report of the UN-OPCW Joint Investigative Mechanism has now been officially released. On the principle that people should take responsibility for what they allow to be published under their names, I’ll refer to the report by the initials of its three named authors as MCM (Mulet, Cheng-Hopkins and Mogl). I have not been able to identify any mainstream journalist who has read the report or commented on it, other than the independent-minded Peter Hitchens. Other incisive commentaries can be found at these links: (1, 2, 3, 4). A detailed technical assessment has been released by the Russian mission to the UN. H1: a chemical attack by the Syrian air force using sarin. From this passage it appears that MCM excluded hypothesis H2 from consideration. On the basis of the information obtained, the following two scenarios were further investigated: (a) sarin had been released through an aerial bomb; or (b) sarin had been released through the explosion of an improvised explosive device placed on the ground. A third scenario with two alternatives was also investigated, neither of which was found to be linked to the release of sarin. As I emphasized in earlier posts, you can’t exclude the hypothesis you haven’t considered, and you can’t evaluate the evidence for a hypothesis without evaluating the weight of evidence favouring that hypothesis over alternatives. For a given observation, this weight of evidence is based on comparing how probable that observation was, given each of the hypotheses under consideration. The key witness was unable to produce a family photograph showing him with his wife; his explanation was that his family home had been coincidentally destroyed in an airstrike at the same time as the chemical attack. The flight track of the Syrian jet showed only a single east-west pass to the south of the town, passing no closer than 2 km from the alleged impact site of the chemical munition. The area where casualties were alleged to have occurred was upwind of the alleged impact site. Several of the children seen laid out in morgues had head injuries: in at least two cases these head injuries were received after they had been “rescued” from the alleged chemical attack. I assessed that each of these five observations contributed a likelihood ratio of about 20, equivalent to a weight of evidence of 4 to 5 bits favouring H2 over H1. This gives a total weight of evidence of about 20 bits: a likelihood ratio of 1 million to one. Of these five observations, the only one considered by MCM was the flight track of the Syrian jet. depending on a number of variables such as altitude, speed and the flight path taken, it would be possible for such an aerial bomb to be dropped on the town from the aforementioned distances. The heavily qualified wording of this sentence suggests that the expert did not state that the alleged impact sites were compatible with the recorded flight track. As the Russian Ministry of Defence briefing pointed out, while it might just be possible for an Su-22 travelling at maximum speed and altitude for bomb release to toss a bomb 5 km ahead of the release point, the jet would still have to turn after releasing the bomb, and this would take it within 2 km of the impact point. However the flight track is even more unequivocally incompatible with the alleged airstrikes than this argument implies. The flight track shows only a single east-west pass to the south of the town. Under H1 this flight track has to account not only for the crater that was the alleged impact site of a chemical munition, but also for the high explosive bombs that allegedly caused the three explosions documented by plumes on videos and images of damaged buildings, and for whatever device caused the cloud of white fog also mentioned by MCM (discussed below under “other relevant observations”). Of the four other observations listed above, the only one on which MCM comment even briefly is the wind direction. They ignore the videos showing the wind to have been blowing from southwest to northeast (away from the alleged location of victims southwest of the crater), and decide instead that the “prevailing air movements” must have been in the direction implied by hypothesis H1. MCM and the Russian experts who disputed their conclusions discussed in some detail whether the images of the crater were compatible with an air-dropped bomb containing only a small bursting charge or with a ground-based improvised explosive device. Under either H1 or H2 we would expect the crater to look as if it had been struck by a munition dropped from the air. Under H2 we would expect this appearance to be created deliberately, perhaps using one of the short-range siege engines known as “Hell Cannons” to drop a heavy projectile. We would also expect the remnants of such a munition to be removed before taking photographs, so their absence from the images is not evidence against the use of such a munition. MCM examined images of “two objects of interest” in the crater: a “deformed piece of metal” and “a circular metal object that appeared to be a munition filler cap”. The assertion that the filler cap “is uniquely consistent with Syrian chemical aerial bombs”. has been disputed, but in any case this is not evidence favouring one hypothesis over another; under either H1 or H2 we’d expect to find remnants of something resembling a chemical munition. So neither the images of the crater, nor the images of the munition remnants allegedly found in them, contribute compelling evidence favouring either H1 or H2. In my last post, I noted that if H1 were true, one of the observations that might be expected to contribute evidence favouring H1 over H2 would be if a chemical signature match between the environmental sarin samples and Syrian military stocks were reported by scientists prepared to put their names on a report that was detailed enough to be subjected to peer review. MCM’s report doesn’t meet this criterion, but it contains some interesting new information about the analysis of the Syrian military stocks of methylphosphonyl difluoride (DF) that were destroyed by US Army engineers under OPCW supervision on board the MV Cape Ray in 2014. It was reported in 2014 that gas chromatography / mass spectrometry profiling was carried out on board. A formal chemical signature attribution study to determine whether samples of sarin could be matched to these samples of DF would be based on using the profiles of hundreds of impurities that are detected by mass spectrometry, with control specimens including samples of sarin synthesized independently, and multivariate statistical analysis as described in this paper. We are told only that the Syrian military stocks of DF contained “phosphorus hexafluoride” (presumably this means the hexafluorophosphate anion PF6–) and phosphorus oxytrichloride (POCl3). As phosphorus oxytrichloride and hexafluorophosphate were also reported in the environmental samples allegedly taken from Khan Sheikhoun, MCM concluded that “the presence of marker chemicals that are believed to be unique” was “a strong indication” that the sarin from KS was produced using DF from Syrian military stocks. I am not expert in chemistry, but fortunately on this blog we have been provided with a detailed briefing on the impurities likely to be present in sarin in comments here and here by an experienced organic chemist who writes as DDTea. Step 4 of the synthesis of sarin uses a chlorinating agent: either thionyl chloride or phosphorus pentachloride. DDTea explains that if phosphorus pentachloride is used as the chlorinating agent, phosphorus oxytrichloride is produced, and this is likely to produce hexafluorophosphate in step 5. On this basis, the presence of phosphorus oxytrichloride and hexafluorophosphate in the Syrian military stocks of DF indicates only that phosphorus pentachloride was used as the chlorinating agent. This process is not “unique” as MCM assert: for instance the Aum Shinrikyo terrorist group also used phosphorus pentachloride in step 4, and phosphorus oxychloride was detected in their lab. MCM assert that the presence of hexafluorophosphate indicates that hydrogen fluoride (rather than sodium fluoride or potassium fluoride) was used in step 5. Russian experts dispute this, stating that “It is well known that phosphorus hexafluoride is produced by fluorination of phosphorus chloroanhydrides also using fluorides of alkali metals [sodium fluoride or potassium fluoride] and compounds of hydrogen fluoride with tertiary amines”. The JIM’s argument is that use of hydrogen fluoride (a highly dangerous gas) “indicates a high degree of competence and sophistication in the production of DF and points to a chemical-plant-type production method.” Even if the JIM is correct in asserting that hydrogen fluoride was used, this is not compelling evidence favouring H1 over H2. Under H2, only bench-scale quantities of sarin need be produced to lay a trail of forensic evidence. Under H2, the objective of producing sarin is to implicate the regime, so we would expect opposition chemists to add to their sarin any chemicals that would help to implicate the regime: certainly they would have added hexamine which had been widely publicized as an alleged hallmark of the process used by the Syrian military to produce sarin from binary precursors. The confirmation that OPCW had access to samples of Syrian military DF since 2014 raises again the question of why the Joint Investigative Mechanism has not investigated whether the sarin recovered from alleged chemical attacks in 2013 matches Syrian military stocks. We can reasonably assume that if it had been possible to declare such a match, based on a formal chemical signature attribution study rather than one or two impurities, this finding would have been widely publicized. The French “national evaluation” asserted that sarin from Khan Sheikhoun matched samples recovered from an alleged chemical attack in Saraqeb on 29 April 2013, but this was based on the presence of hexamine (allegedly used in the final step of sarin synthesis), rather than on the full chemical profile. Phosphorus oxychloride was not reported in samples obtained from alleged chemical attacks in Syria in 2013. This suggests that the synthetic pathway for the sarin used in alleged chemical attacks in Syria may have changed between 2013 and 2017 from using thionyl chloride (which was on the shopping list of the Nusra procurement team arrested in Turkey) to using phosphorus pentachloride, thus matching the synthetic pathway implied by the impurities in Syrian military stocks. After western governments had shown no interest in comparing sarin from the alleged chemical attacks in 2013 with the Syrian military stocks of DF that were destroyed in 2014, it is remarkable that Chulov’s source was anticipating, the day after the alleged chemical attack in Khan Sheikhoun, that samples taken from it would be matched to these stocks. If “intelligence officials” were able to take samples from the Syrian military stocks destroyed on the MV Cape Ray, we cannot exclude the possibility that these samples could have been used to lay a false trail of forensic evidence, or that an outline of the chemical profile of these stocks could have been provided to opposition chemists. The Russian assessment states that the Syrian government had given information on the methods of synthesis of their military stocks of sarin to the OPCW, and warns that “a real possibility exists that the DF (methylphosphonic acid difluoroanhydride) and sarin were deliberately synthesized using the allegedly Syrian formulas which are well-known both to the OPCW and beyond that international structure to be utilised as a means of a provocation designed to compromise the Syrian government”. The cause of the plume that was shorter and whiter in appearance than the other three could not be conclusively identified by munitions experts engaged by the Mechanism. Two experts noted that the plume had probably consisted of aerosolized droplets of liquid. One explained that the plume’s appearance might indicate the use of a vacuum bomb that had possibly failed to explode, with the plume being a cloud of explosive liquid that had disseminated from the munition. Adam Larson has made a detailed study of the white fog, which originated at two sites, one in the centre of town just north of the tel (mound) as noted by MCM, and one at a farmhouse just southwest of the town. The fog originating near the tel is seen in the video to be expanding steadily over at least 17 seconds, and is seen 20 minutes later to have spread northeast on the prevailing wind, eventually blanketing most of the town. This sustained emission of white fog is typical of military smoke generators that emit aerosolized oil droplets, rather than a fuel-air explosive device (“vacuum bomb”). The Syrian opposition is known to possess such smoke generators, and it is possible that they were used to create the impression that the town was under chemical attack. Although there were purported eyewitness reports of fog spreading through the town, there was no report of what happened at the sites where it originated. It is possible that satellite images of the smoke pouring from one of these sites were initially misinterpreted by US military analysts as indicating that an airstrike had caused a fire releasing toxic smoke from stored chemicals. A story to this effect was relayed on 6-7 April by at least two retired officials known to have sources in the US military or intelligence agencies: Phil Giraldi and Lawrence Wilkerson. Unfortunately this story, pursued separately by Seymour Hersh and Gareth Porter, led these two distinguished investigative journalists astray. Combustion of stored pesticides could not produce chemicals that test positive for sarin. Proponents of the regime attack hypothesis have focused on debunking this story, while ignoring the compelling evidence favouring a managed massacre. Staging a hazmat investigation for cameras is not, in itself, compelling evidence that the entire incident was staged. Evidence that purported first responders are not helping victims is stronger evidence favouring a managed massacre over a chemical attack. As MCM noted, the videos show that “rescue personnel” were hosing victims for up to 40 minutes, in temperatures only a few degrees above freezing. Other videos show that children were piled in pickup trucks, with the living and the dead apparently mixed together to be photographed. Some of these children were taken on rides to hospitals for staged attempts at resuscitation hours after they had died. Others were seen laid out in morgues with head injuries that in at least two cases can be established to have occurred after they were “rescued”. This passage is worth quoting in full. The mention of a “possible staging scenario” suggests that MCM considered something like a managed massacre as one possible explanation. It’s not possible to evaluate this as evidence without more information – we’re not told for instance whether the admission times were handwritten or computer-generated. It’s possible that this could be explained by some confusion over time zones, or the switch to daylight saving time a few days before. However MCM’s failure to investigate this further suggests that they were not too concerned by whether or not the discrepancies could be explained. The most important new evidence in MCM’s report is the additional detail of the flight tracking. Clearly the story of air strikes is incompatible with the flight track map shown at the Pentagon’s press conference (with a misleading caption stating that “An aircraft originating from Shayrat airfield was over Khan Sheikhoun”), and with the other map described by MCM. Unless this flight track was wrong, which MCM do not suggest, the hypothesis of a chemical attack by the Syrian air force can be excluded as having zero likelihood. This raises questions about the role of the Pentagon in misleading not just the media, but also the President. The weight of evidence favouring the hypothesis of a managed massacre over a chemical attack has obvious implications also for the role of the White Helmets in this incident. Report Authors: JIM head Edmond Mulet speaks to the press after briefing the UN Security Council, flanked by fellow JIM leaders Judy Cheng-Hopkins and Stefan Mogl. This entry was posted in chemical weapons, conspiracy, guest blog, OPCW, Syria, Syrian opposition, UK Government, Uncategorized, war, White Helmets. Bookmark the permalink. S/1510/2017 6.23 tells us that the “greater number of witnesses” has “imparted greater confidence in the narrative and any resultant conclusions”. 5.14 refers to “a swooping sound, as made by a jet” and 5.15 to “hearing the noise of the jet” – not just any noise but both specifically a jet. But the JIM tell us the jet in question was at least 5km away: there was no jet over the town for the witness to hear. HRW went further in their Death by Chemicals report and offered eye witnesses to a ‘first fly over’ who saw a plane fly over the town and drop a bomb. If the flight track is accepted as true, these witnesses must have been lying to both the FFM and HRW. The narrative in which the FFM had “greater confidence” cannot be right. One of those HRW witnesses (al-Hussein) is even credited by Smart News with having filmed and photographed the widely shown washing scenes. Put simply, if a real CW attack, why lie? 5 km is about as far away on the map as it would be in altitude if it were directly above, so it would be audible, and I think it’s even heard at the start of the earliest video. Distant but audible. But their stories or their overall gist are clearly false anyway. Jim noted “conflicting claims” about jet location but one claim is a radar track (or 2 of them, actually, both agreeing). That should be a past-tense conflict. But would of course be *at least* 5km away and in the context of Ismail Raslan’s story of an attacking jet (quoting 5.14 more fully “a swooping sound, as made by a jet when it attacks”). HRW also quote Raslan as having heard a plane “fly over” which demonstrably did not happen. The argument that the “plane never flew over Khan Sheikhoun” betrays a total ignorance of projectile motion (5 km, or even 10 km, is well within range of a dumb bomb without a motor). It also relies on us to interpolate a 3D flight path on 2D data points, and there are multiple ways that can be done with the public radar data. How McKeigue has determined that it was “impossible” for the Syrian aircraft to drop the bomb, is a mystery. He has not shared his interpolated flight path or his calculations that led to this conclusion. This is silly anyway: there is video evidence of bombs falling on Khan Sheikhoun at the time of the sarin attack, which is mentioned in this very blog post, and you can hear the jet in the video. Wherever the plane was, it could hit KS. In fact, the most widely circulated “alternative explanations” involve a SyAAF jet hitting an Al-Qaeda chemical weapons depot, or meeting house that was storing chemicals. Has McKeigue’s “Bayesian probability calculus” been validated (and peer reviewed) on any other historical or current events, such as the Moon Landing, the Roswell alien, 9/11, etc.? If so, why should we trust that this is a meaningful exercise and not simply a display of bias hiding under statistical terminology? To me, it looks like his evidence is simply based on his selected reading and does not–and cannot–include every possible scenario. No, this comment belies ignorance of how that range might actually work. A bomb can travel kilometers off from straight down, true. But that’s only because of and in line with the attacking aircraft’s trajectory. That is, it’ll fall ahead of the drop point, somewhere along or near the flight path (depending if it was in a turn, etc.). It won’t drift 3 km off to the left unless the wind can somehow do that. Now look at the presented flight track and see if this concept can explain that. I doubt any “3D” aspect matters much here, but indeed the shown path may be incorrect in a number of possible ways. In fact I recently looked at this and found … something that’ll interest you. But note: the JIM’s “other aerial map” is said to show the one jet passed no closer than about/within/at least 5 km from town (edge? sarin crater?) Is that the same kind of erred image, distance rounded up? Another that’s more erred, or accurate? In what direction was it at that distance? I wish they had provided the visual). Their verbal description does have a best fit within the radar track, as I show. That could be the real path, but we can’t say at this point. According to the apparently shown path, there’s no way it could have dropped a bomb that landed on any of the affected spots, and especially not on the sarin spot furthest north. That’s not mysterious. It’s just not as certain as it seemed. – the second jet or jet pass everyone saw to drop the conventional bombs. No other tracks come close. – a plausible reason that sarin would spread upwind instead of downwind like usual. The supposed downhill slope to the SW, also untrue FWIW, only matters in the absence of wind, but the video record proves there was ample wind, just opposite of what they need. No one has debunked this yet. Scott Lucas says he can and will when he has time. I doubt it. He’ll have some off-topic quibbles to try and side-step it. – the total lack of rescue or in-situ videos, consistent with them being hostages killed (or set to die) in centralized gas chambers before being trucked to the “hospital” to be hosed down in the mud and the cold as they died on camera with no real assistance. No. There is “video evidence,” sure, but not video proof. We hear the jet, as far as we can tell, just passing by about 5 km to the south. My proposal and I think Paul’s, is the HTS and allied Islamists had some blasts timed to happen as any jet passed close by. Either it was a routine dawn overflight, or they did something the night before to draw attention in the morning. And they also would have some people ready to gas, whatever else helps create the picture, like smoke generators to create a “sarin fog” all over the town. That this was proposed and widely circulated is really annoying. Russians and some fans are to blame. Syria always denied they bombed anything in or around KS at the time, and so far I still suspect that’s true. I propose its wide circulation doesn’t matter to the strength of my own and Paul’s and others’ better, updated arguments that your pan of that doesn’t touch. I found the flight path debunk you’ll wish you had found, and I’m already not convinced by it. You have nothing else. But thanks for trying and giving me this thing to smash in public. No, this comment belies ignorance of how that range might actually work. A bomb can travel kilometers off from straight down, true. But that’s only because of and in line with the attacking aircraft’s trajectory. That is, it’ll fall ahead, somewhere along or near the flight path (depending if it was in a turn, etc.). It won’t drift 3 km off to the left unless the wind can somehow do that. Now look at the presented flight track and see if this concept can explain that. I doubt any “3D” spect matters much here, but indeed the shown path may be incorrect in a number of possible ways. In fact I recently looked at this and found … something that’ll interest you. But note: the JIM’s “other aerial map” is said to show the one jet passed no closer than about/within/at least 5 km from town (edge? sarin crater?) Is that the same kind of erred image, distance rounded up? Another that’s more erred, or accurate? What direction was it that distance? I wish they had provided the visual). Their verbal description does have a best fit in the radar tracks, which I show. We can’t say if that is or isn’t the true path. 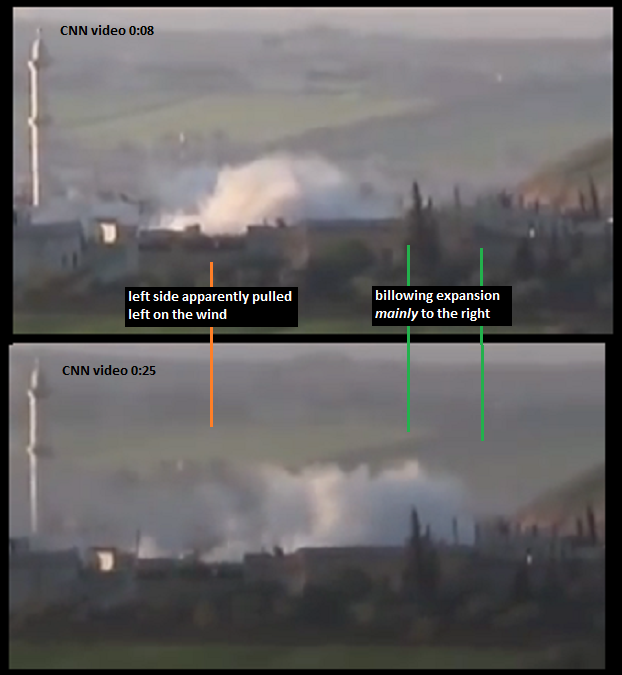 – a plausible reason that sarin would spread upwind instead of downwind like usual (the supposed downhill slope to the SW, also untrue FWIW, only matters in the absence of wind, but the video record proves there was ample wind, just opposite of what they need). No one has debunked this yet. Scott Lucas says he can and will when he has time. I doubt it. He’ll have some off-topic quibbles to try and side-step it. – the total lack of rescue or in-situ videos, consistent with them being hostages killed in centralized gas chambers before being trucked to the “hospital” to be hosed down in the mud and the cold as they died on camera with no real assistance. That this was proposed and widely circulated is really annoying. Syria always denied they bombed anything in or around KS at the time, and so far I still suspect that’s true. I propose its wide circulation doesn’t matter to the strength of my own and Paul’s and others’ better, updated arguments that your pan of that doesn’t touch. I found the flight path debunk you’ll wish you had found, and I’m already not convinced by it. You have nothing else. But thanks for trying and giving me this thing to smash in public. 5.89 The team noted that the blood of person reference numbers 131814, 131820, and 131825 tested negative for sarin or sarin-like substances, yet other biomedical specimens from the same people tested positive for isopropyl methylphosphonate. Although isopropyl methylphosphanate is a degradation product of Sarin and its presence can be taken to indicate Sarin exposure, it is also commercially available.